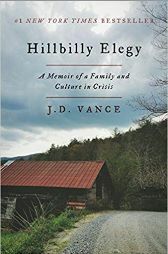 Our book for April is Hillbilly Elegy by J.D. Vance. Cindi Jorgensen helped pick this book and will help lead the discussion 1-3 PM and 7-9 PM on April 3 and April 17. This book has been a runaway best seller ever since it was published several months before the election in 2016. It has opened a discussion on Appalachian life – how people make a living, how they are stereotyped, how they have survived, or not survived, in the industrial economy of West Virginia. J.D. Vance’s story is based on memories from his childhood and growing up and is very appealing. The book has been treated by some politicians and talk show hosts as authoritative for all things Appalachian, particularly why most residents of Appalachia voted for Donald Trump. On April 3 we will discuss the book and, if time, view a TV interview or two with J.D. Vance. On April 17 we will view and discuss the documentary filmHillbilly, released this year (2019) by a film producer who grew up in rural Kentucky. Hillbilly powerfully captures the geography, the people and the history of Appalachia. It gives a complicated – and much harder to stereotype – picture of Appalachian people and communities than does the book. You are invited to come to either or both of these events! I am really looking forward to these discussions. Hillbilly Elegy can be purchased from Amazon at: http://a.co/d/aFvPSyo. Two copies are also available either from Christine Jarman or in the BBUUC Library. 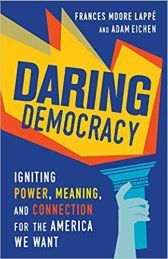 For those looking to read in advance, the book for May is Daring Democracy: Igniting Power, Meaning and Connection for the America We Want, by Frances Moore Lappé and Adam Eichen. This book was a UUA Common Read for 2017-18. It is available at: http://a.co/d/dH5XLnB. And again, two copies are also available either from Christine Jarman or in the BBUUC Library. If you know you are coming or have questions, let us know at bookclub@bbuuc.org.